Unlike Cabbage Patch dolls of the '80s, cabbage the food is a hot ticket for winter dinner. Cabbage is super – healthy, versatile and easy to cook. 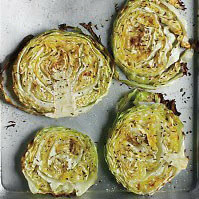 Martha Stewart likes to slice and roast hers in a drizzle of olive oil and caraway or fennel seeds for about 40-45 minutes at 400 degrees F.
Cabbage is known as a staple food of winter, food of the peasants, humbly and reliably prepared throughout the world and throughout the ages. But really, it is so much more. Not only has it outlived its namesake weird looking stuffed dolls of the ‘80s, but now it’s being discovered as a superfood for the 21st century. Something so inexpensive and ubiquitous is a fine discovery. It’s even finer when you realize there are so many ways in which it’s unusually good for you. Despite its typically pale color, it’s packed with an alphabet of vitamins (K, A and C in particular) plus calcium, fiber, folate and Omega-3. And it’s well documented by now for having significant cancer-fighting properties. We visited cabbage back in the late summer, via the usual route of chopped salads and slaws, but a winter trip is worth the time. First up is the kimchi option – similar to slaw in that it uses raw cabbage, but fermented so it lasts even longer. Cabbage also makes a great hot dish. While it’s crunchy and sharp tasting when raw in a salad, given time in a sauté, stew, or braise, it softens into silky sweetness and blends well with most vegetables. And cabbage leaves are a classic wrapper (healthier than a tortilla), the large leaves enveloping whatever stuffing you whip up. The different varieties are suited to slightly different uses. Savoy cabbage is the distinctive, fancy curly kind; it cooks more quickly than the other varieties – it doesn’t need the hour long stew treatment that green or red cabbage does – and its leaves stand up well as wraps. Napa and Chinese cabbages are crisp and milder tasting, oft-used for kimchi. Red cabbage will lose much of its color when cooked, unless you add a bit of acid (such as vinegar) to the mixture. It will also color whatever else you cook with it, so sometimes green cabbage is a better choice because it provides a more neutral backdrop to other ingredients. In the spirit of the many Eastern European cultures that rely on cabbage to get them through the winter, here’s a recipe for cabbage stuffed with spiced beef, from The 10 Things You Need to Eat by Dave Lieberman and Anahad O’Connor. Bring a large pot of salted water to a simmer. Core the cabbage from the bottom, leaving the head intact. Drop the head of cabbage into the water and use tongs to remove about 14 of the largest leaves of the cabbage as they pull away from the head of cabbage and become tender. Set them aside on a large plate to cool, transfer the pared-down head of cabbage to a cutting board, finely chop it once it has cooled sufficiently to handle, and reserve. In a large mixing bowl, combine the beef, eggs, garlic, paprika, cayenne thyme, cloves, salt, pepper, and rice and stir until all the ingredients are well incorporated. Place about ¼ cup of the meat mixture in the center of each of the whole tender cabbage leaves and wrap up snugly by folding in the sides, folding up the bottom, and tucking under the top. Place the stuffed cabbage leaves in a 9 × 13-inch Pyrex baking dish. In a large mixing bowl, whisk together the tomato paste, ketchup, stock, and reserved finely chopped cabbage. Pour over the top of the stuffed cabbage leaves. Cover loosely with aluminum foil and bake for 1 hour.